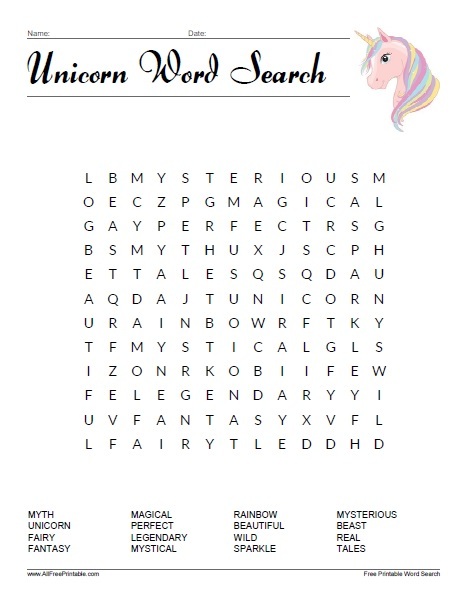 Free Printable Unicorn Word Search. Print this Unicorn Word Search to have fun with your guests at your next party or special celebration like birthday, anniversary and baby shower. Share with your students, friends, family and everyone that loves Unicorns. Find words related to unicorns like Magical, Myth, Wild, Sparkle, Beautiful, Real, Legendary, Rainbow, Perfect, Fantasy, Fairy, Mysterious, Tales, and many more. This word search includes 16 words and the solution on page 2. The Unicorn Word Search puzzle is ready to print in PDF format.